Welcome to the GBD Nutrition website. It is well known that what we eat influences our health, but how much disease burden can be attributed to diet, and what components of our diet are most harmful? The Global Burden of Disease (GBD) study provides some of the answers to these questions by tracking risk factors as well as diseases and injuries. GBD estimates now include over 70 different risk factors, including dietary risks. Diet contributes to non-communicable diseases (NCDs) such as cancer, cardiovascular disease, and diabetes. Our data visualizations, including GBD Compare, depict which components of diet contribute most to which conditions. Risk factors include diets low in fruits, vegetables, whole grains, nuts and seeds, fiber, milk, calcium, omega-3 oils, and polyunsaturated fatty acids; and high in sodium, red meat, processed meat, sweetened beverages, and trans fats. Until recently, undernutrition – too little food – was a major concern in many developing countries. Over the past 25 years, however, the burden of disease in these areas has shifted toward NCDs, diseases of overnutrition, unhealthy diets, obesity, and lack of physical activity. Understanding these dietary components can help policymakers develop targeted interventions to improve health at the population level, not just by reducing consumption of harmful foods, but also by encouraging people to eat health-promoting foods. 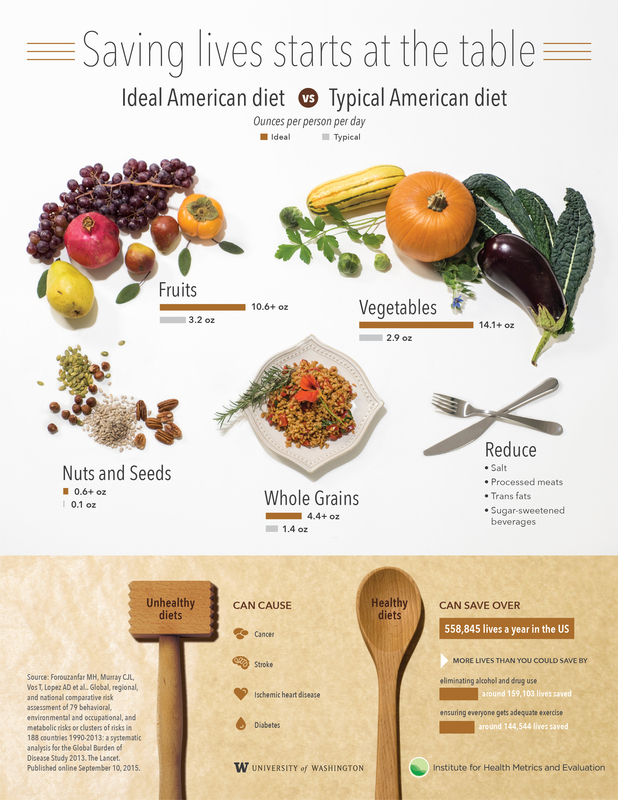 To learn more about diet and how it relates to the GBD study, please visit this link or look at this infographic. If you would like to join our team and help contribute to dietary research, please apply here.